It’s May. Flowers are finally blooming. The weather is (hopefully) getting warmer. Memorial Day is just around the corner, which means summertime! It also means being outdoors more, wearing lighter clothing and more exposure to the sun’s rays. Yes, May is Skin Cancer Awareness Month. It’s that time when we warn everyone about the harmful UV rays of the sun and about the dangers of tanning. We know that everyone is anxiously looking forward to their summer vacations, days lying on the beach or by the pool, ‘working on their tan’. Our recommendation would be to leave that ‘work’ behind. Have you ever burned your hand on a hot pan coming out of the oven? Your skin reddens and sometimes blisters. And it hurts … a LOT! If your skin is exposed to the sun for too long, it also can burn. But this burn can cause long-term damage to your skin. Anyone with fair skin can probably remember a time when they have suffered a sunburn. It’s no picnic. For some people, the pinkness turns browner, resulting in a suntan. Others may simply peel or blister. Many people think that first group of people are luckier and healthier. They don’t ‘burn’ so it must not be bad. After all, everyone wants a nice suntanned body. But did you know that all a suntan really is, is damage to the skin? It’s a fact that sunlight can have a positive effect on mood and energy levels. And not all sun rays are harmful. However, the sun does produce very harmful ultraviolet (UV) rays, which actually damage the DNA of skin cells. 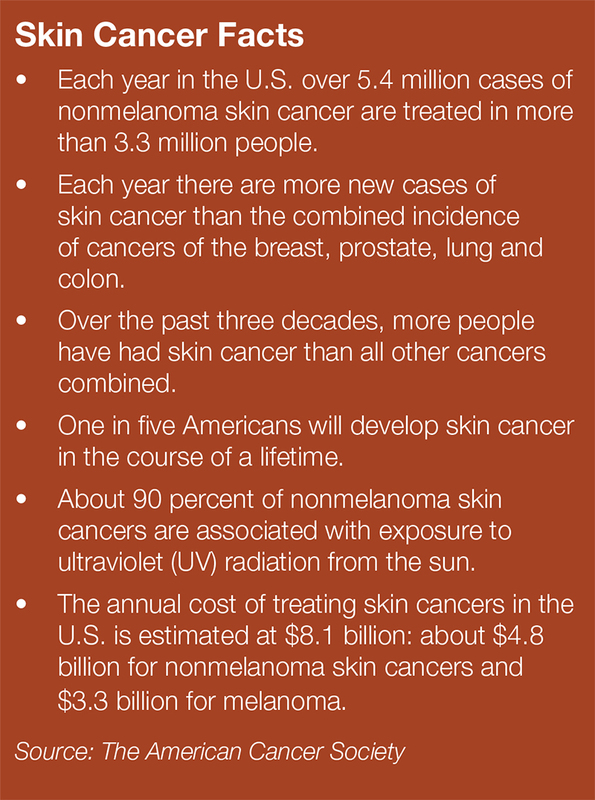 It is this exposure that causes skin damage and even skin cancer. Sunlight at any time of the year, can expose you to UV rays, however, they are strongest in the summer months and between 10 a.m. and 4 p.m. The Skin Cancer Foundation recommends using a sunscreen with an SPF 15 or higher as an important part of a daily sun protection regimen. SPF or sun protection factor is a measure of a sunscreen’s ability to prevent UVB from damaging the skin. A sunscreen with an SPF of 15 would allow a person to be in the sunlight 15 times longer than without any sunscreen. It does not mean you will not burn! For example, if it typically took 20 minutes for your skin to redden, a sunscreen with an SPF 15 rating, in theory, would allow you to be in the sun 15 times longer (5 hours), before you start to burn. However, the Skin Cancer Foundation cautions that regardless of strength, no sunscreen should be expected to stay effective longer than two hours without reapplication. Second, “reddening” of the skin is a reaction to UVB rays alone and tells you little about what UVA damage you may be getting. Plenty of damage can be done without the red flag of sunburn being raised.